first church cookbook in Greendale. It's a great brownie recipe and I've used it often over the years. Today I've changed it up a bit by adding coffee and coconut. Just think how good it would taste with that mid-afternoon cup of coffee! Place coconut in a skillet over medium heat. 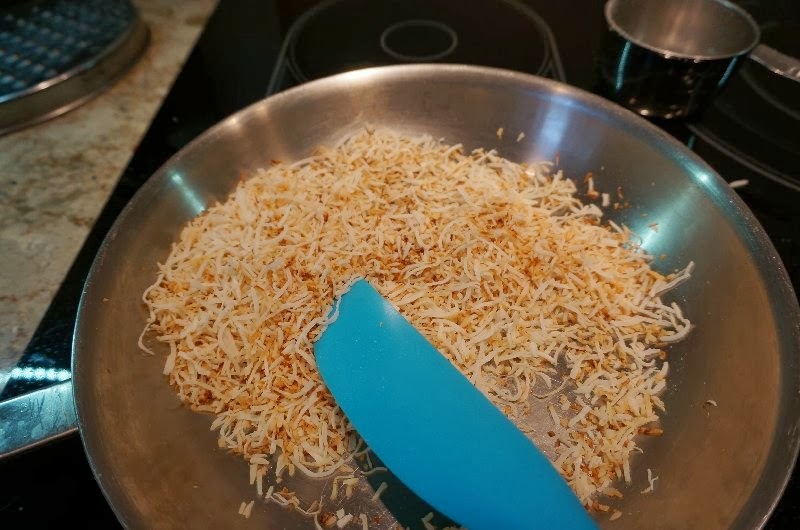 Stir constantly until coconut is golden brown, watching closely as it burns easily. Remove to a plate and let it cool. Set aside 1/2 cup for the frosting. Add 1 teaspoon boiling water to instant coffee granules in a small cup and stir to dissolve. Set aside to cool. Place brown sugar and butter in bowl and beat well. Add eggs one at a time beating between additions. Add coffee and vanilla and mix. Add cocoa, flour and salt, mixing just until blended. Spread evenly in buttered 9"x13" pan. Bake at 400º F for approximately 25 minutes or until toothpick inserted into brownies comes out clean. Remove to a rack and let cool in pan. Note: Lorraine's original recipe calls for 2 teaspoons of vanilla (omit the coffee granules and hot water) and uses 1 cup chopped nuts instead of the toasted coconut. Mix coffee granules with hot water and set aside. Add coffee mixture and vanilla. Add enough cream to make frosting thick but easy to spread. 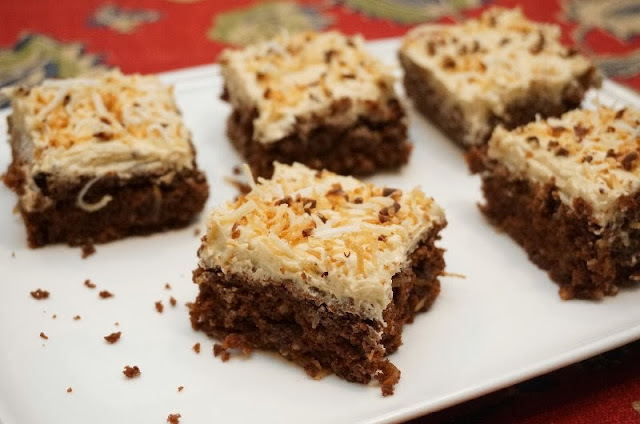 Top with toasted coconut and shaved or grated chocolate. can the frosting be made without the coconut? I'm not a coconut fan but the remainder of the recipe sounds yummy. What size pan does this require? Pat and Barb,Thanks for alerting me to the missing pan size. I've updated the recipe with the 9"x13" pan size. WP girl, feel free to use pecans or walnuts in place of the coconut in the brownies and omit the coconut altogether or sprinkle pecans or walnuts on top if you are not a coconut fan. Oh my gravy!!! These sound absolutely divine. I need to stock up on coconut! I could easily "eat myself sick" as my mother used to say, especially with a tall glass of milk. I love the taste of toasted coconut. I tried these. They are delicious! !